As we prepare for the holiday season, we prepare for a time of feasting and the inevitable result… leftovers. When we have an abundance of food available, we tend to stash away the excess for a later day. However, humans aren’t the only animal to exhibit this behavior. Our local wildlife also stashes food away when it is abundant so they can continue to enjoy the feast over the chilly winter months. In the natural world, this behavior is known as caching. We will take a look at a few of our wild neighbors and how they store their leftovers. One of our local mammals famous for its food storing behavior is the red squirrel, often seen scurrying busily about and heard chattering from high in the tree tops. To understand this noisy and somewhat aggressive behavior, we need to understand the caching behavior of our furry friends. Because red squirrels do not hibernate, they devote the vast majority of their warmer days to gathering and storing food. They have been known to cache away massive stockpiles, the largest reaching nearly the size of a garage. Squirrels typically gather coniferous cones, seeds, fruits, and mushrooms to stash away. However, there are always a few squirrels who find it easier to grocery shop in another squirrel’s cache than to do their own gathering. The aggressive behaviors we see in squirrels such as tail flicking, noisy chattering, and occasionally even throwing objects from treetops, is actually defensive behavior. The next time you hear a squirrel noisily calling down from the tree tops, try to remember that squirrel is simply defending their cache to help them survive the frigid winter. Another of our local mammals that cache food away is the mountain lion. Here in Colorado, a mountain lion’s ideal food source is mule deer. However, they will also prey on mountain goats, elk, moose, beavers, and occasionally, mice, rabbits, and birds. A mountain lion can consume up to 20 or 30 pounds of meat in a single serving. However, when they manage to take down a larger animal such as a moose, they will drag the leftovers away to a secluded spot where they typically bury their cache, then return to it for up to 10 days to continue their feast. By performing this caching behavior, they are able to spread out an abundant meal and allow it to last a little longer. The Clark’s nutcracker, a local bird related to ravens and crows, shows us that caching isn’t just for mammals. This unique bird has some amazing adaptations that allow it to store food. Like its relatives, this bird is known for its intelligence and sharp memory. Clark’s nutcrackers’ favorite food source to stash away are pine seeds, but they will occasionally feed on insects, chipmunks, carrion, and even smaller birds. These birds have a unique pouch under their tongue that allows them to carry up to 150 pine seeds at a time. After filling their pouch, they will fly up to 15 miles away to cache their treats. Using an episodic memory strategy, they remember each specific cache location, and return up to 9 months later to retrieve the seeds. 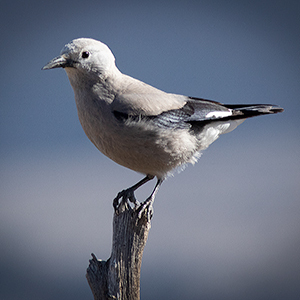 This unique caching behavior allows the Clark’s nutcracker to thrive through the snowy winters of the Rocky Mountains. These are just three examples of animals that store leftovers from a time of plenty. There are many other animals that will perform a similar behavior, including foxes and weasels. As you pack up your leftovers from holiday fests this year, keep in mind our wild relatives who are busy performing a very similar behavior. Carlee Bane is a Naturalist Intern at Walking Mountains Science Center in Avon. She has an undergraduate concentration in Animal Behavior, and enjoys noting similarities between humans and our wild cousins. Chris Fisher, D. P. (2000). Mammals of the Rocky Mountains. Lone Pine Publishing.